The album starts with the beguiling, mellow tones of late great Rasta singer Bim Sherman. Lightning and Thunder is a Mungo's remix of a vocal supplied by master producer/engineer Adrian Sherwood. Next up is French collective Subactive's aquatic dub imagining of Follow Me by UK Garage/Grime project Wolves, featuring the voice of Bo* Johnson. Another veteran revisits his past when hypnotic Jamaican deejay Supercat straddles Chief Rockas' update of the classic Gunshot riddim for a reprise of "the Don Dada's" 1982 hit Dance Inna New York. The vibes then travel bang up to date with a sparse Mungo's fix of ethereal singer-songwriter Nem's 2017 eco-breakout Purest Force. Jamaican chanter Isha Bel pays tribute to her faith and follicles during Locks, given a belly-battering bass blend by Aquarius. The A side closes with a continuation of the Rasta theme. General Jah Mikey, channelling Burning Spear for his own Ites Green and Gold, rides a deft digital riff by bald-head New Zealand-based super-producer Naram. The B side kicks off with a meeting of reggae's finest from the city of Leeds. Danny T and Tradesman build an industrial-strength base for anti-violence lament Up Deh: a rare vocal outing from Iration Steppas' Mark Iration. Then it's time for Poland's Dreadsquad to ease the pressure with swinging one-drop vibraphone instrumental Space. JA meets "Glasgae" for Feel Good, an uplifting collab between Jamaican singer Skari and Scottish producer Escape Roots. Fans of Prince Fatty covering Kraftwork on the previous comp will rate vintage reggae voice Earl Sixteen, wrapping his pristine pipes around Joy Division's Love Will Tear Us Apart, helmed hauntingly by Capitol 1212. Scotch Bonnet's own Thomas Stalawa gets everyone marching to a beat inspired by Steely and Clevie's Dem Bow, as dangerous Spanish emcee Ponchita Peligros demands all in attendance Run the Calypso. The album ends with a request from un-categorisable Israeli collective Trillion featuring General G that puffers choose wisely - via anti-cigarette missive No Nicotine. 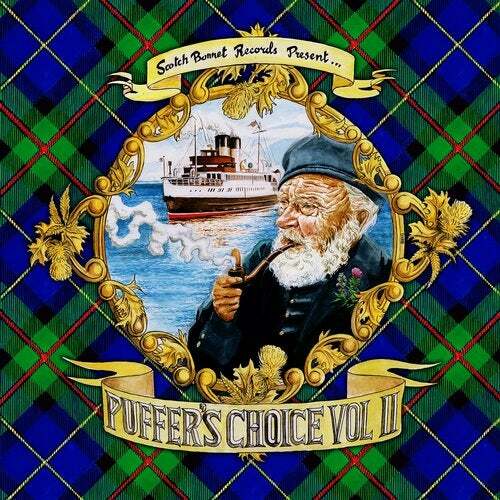 The Scotch Bonnet crew think you'll agree: Puffers Choice volume 2 continues the bass-heavy balance of budding and seasoned performers, from "yard and abroad". It's another outer-national reggae and dancehall party you'll pull up and play, again and again.